As China casts its gaze and ambitions toward South Asia, it will be forced to contend with more than a few geopolitical thorns in its side. One such thorn includes China and India’s decades-long border dispute that has come roaring back into the spotlight after the Dalai Lama, long based in the Indian city of Dharamsala after fleeing Tibet in 1959, announced he would visit Tawang, a Tibetan Buddhist pilgrimage destination in the disputed region of Arunachal Pradesh, which Beijing and New Delhi both claim. The Dalai Lama’s life in exile in Himalayan India (along with several thousand Tibetan refugees) has long been a sticking point between the two Asian powers; his choice to visit a disputed border region reveals just how deep the conflict between India and China goes, and what it will mean for Asia and the world. Arunachal Pradesh has been in dispute since the signing of the Simla Convention in 1914, which aimed to demarcate China and India’s border along the McMahon Line, and more importantly, defined the extent of the British Empire’s territorial claims in Asia. Despite numerous talks over the past century, China and India’s current leaders have failed to resolve the issue. China does not recognize the Simla Convention, and India considers the McMahon line its “undisputed boundary” with China: a position the Dalai Lama officially concurred with in 2008. Previously, he had claimed that Arunachal Pradesh was part of Tibet. The British colonial administration’s indifference toward national borders and transnational ethnic and cultural groups in the region, made up of a potent combination of harsh, mountainous terrain, has made China and India’s border (shared with Pakistan, Nepal, and Bhutan) an ever-shifting line on the map. While Pakistan and India’s dispute over Kashmir is well known, China and India’s battle over Arunachal Pradesh receives comparatively little attention. But as China flexes its economic muscles in South Asia through its One Belt One Road (OBOR) initiative in Pakistan and Sri Lanka, China and India’s unresolved scramble for this sparsely populated, rugged corner of the Himalayas will have an even greater impact on regional stability, security, and economic vitality. Much of Arunachal Pradesh’s rise in relevance can be attributed to the ambitions of Indian Prime Minister Narendra Modi and his Bharatiya Janata Party (BJP) that are a part of the wave of nationalist and populist leaders gaining ground globally. Like other populist heads of state, Modi emphasizes Indian economic and political sovereignty, defense against perceived and legitimate foreign aggressors, and a strong national and communal identity. His Hindu nationalist rhetoric has flared tensions with Pakistan and caused concern among India’s sizable Muslim minority, but it has also fostered a tougher stance with China. Modi has voiced his opposition to OBOR due to its role in tightening ties between China and Pakistan, and its potential to challenge Indian sovereignty. Voice of America also views the Indian government’s permitting the Dalai Lama to visit Tawang as a signal that New Delhi can and will assert itself. Modi’s stances on Arunachal Pradesh reflect his nationalist views on Indian sovereignty and identity. Although Modi’s positions seem nationalistic on the surface, globalist ambitions lurk below. Modi’s “Act East” policy emphasizes Arunachal Pradesh and the other states of northeastern India (Assam, Mizoram, Meghalaya, and Nagaland) as a “gateway” to Southeast Asia and its countries’ growing economic prosperity. While Southeast Asian nations such as Malaysia, Cambodia, Thailand, and Myanmar have had religious, cultural, ethnic, and political ties to India since the early days of Asian civilizations, Modi’s “Act East” policy represents a more Asia-focused India than in previous decades. 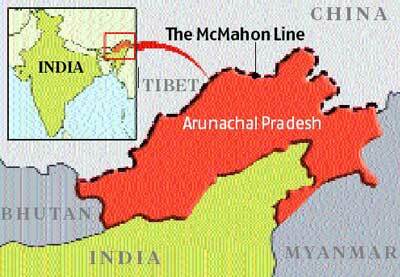 Arunachal Pradesh and the lengthy, blurry border with China are a large wrinkle in Modi’s plan to look east. Modi’s “Act East” policy also looks beyond Asia toward the United States as a counterbalance against China’s growing regional clout, which has been fueled by an expected pull-back on U.S. involvement in foreign affairs under President Donald Trump, according to a 2017 strategic risk report by the Risk Advisory Group. Now more than ever, India needs powerful friends, but it is unclear how much of a friend America can or will be under a Trump-style foreign policy. Collusion with Australia, Japan, Myanmar, and Thailand may prove more feasible in the short run as a countermeasure against Chinese assertiveness, and invite less controversy than openly defying China’s Tibet policies; by offering economic cooperation and perhaps closer cultural ties than China, India can turn at least some of Southeast Asia away from Beijing. Yet, considering China’s sizable investments in the nations India is trying to woo, the fight for Southeast Asia’s hearts and minds will not be easy. Nor will the fight for the mountainous conduits to Southeast Asia. If Modi keeps his gaze steadily eastwards, Arunachal Pradesh, and the hundred-year-old squabble over it, may grow from a long-simmering border dispute to an existential conflict between the great powers of Asia. Image: Bomdila Monastery, Arunachal Pradesh. Wikimedia commons photo/Chaduvari, 14 May 2015, Arunachal Pradesh, India. Previous Post Previous post: Podcast | Episode 4: Don’t Mess with the Free Press!